How and when did you get into woodworking? 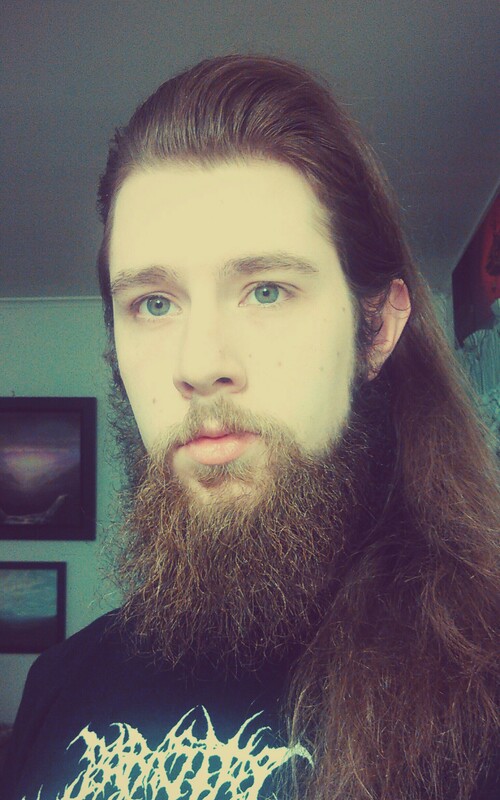 I guess I started as a teenager. 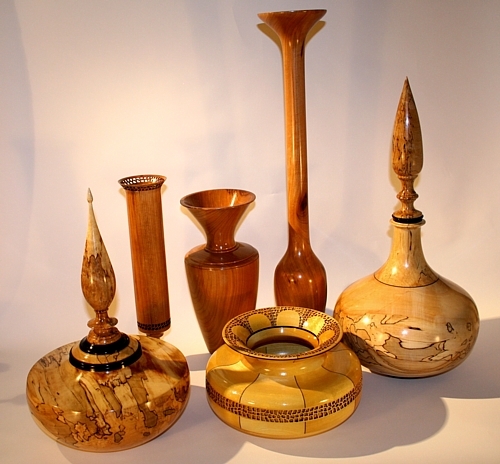 I remember ninth grade woodshop was the first woodturning that I ever did. I think that a piece I made then is still in my mom’s house. As I got older I just kept doing it. I’m a woodturner but I’m also a part-time carpenter, so I have a shop full of tools, a lot of tools! A table saw, radial arm saw, drill press, band saw, belt sander, chop saw, compressors, several router tables, and a whole flock of small stuff. I guess I do have a lot of power tools. I’ve used them mostly to build houses and do renovations on houses. So what size work do you usually produce, is it like the huge statues you see people carve with chainsaws, or is it smaller pieces? There’s no easy answer to that, because I make things from pens up to six foot tall pieces in my woodturning. I do a lot of major work like kitchen cabinets and bathroom renovations, but for the woodturning I do all the way up to six foot floor lamps. What other art forms influence you? I’m also an amateur photographer; I’ve taken tens of thousands of photographs. Unfortunately I took a lot of them before digital came around, and then it was expensive, but now that we have digital it’s less expensive. I’m also fairly involved in the theater arts. I also have done a lot of set work for the Catskill Ballet Theatre that does the Nutcracker at UPAC every Christmas. I have worked on a lot of their productions over the past 25 years like Dracula and Alice In Wonderland. I really enjoyed doing stage work. I once saw a woodworker that only carved bear statues; the only thing he did was make different kinds of bears. Is there a specific theme that you find yourself going back to, or that you like to work with best? That’s absolutely opposite to me. I never make two things the same unless I’m specifically asked to. I have made stair spindles for people where I’ve had to make three or four exactly the same, but normally I only make one of anything. Do you think that’s a common thing in your trade? People in this trade that make an actual living from it can only do so by mass producing. People who are in it for fun and artwork can do whatever they want, and get by with whatever they get for making one of anything. I didn’t want this to be my job. I didn’t want to have to make sixty two spindles today for a contract, I wanted to be able to work if I wanted to or not, and then make whatever I want to make. It’s a little different. What I like about displaying in the gallery in Hunter is that I make everything and you don’t know I’m making it, and whenever I get it done, if I ever get it done, then I bring it up to you and there’s no pressure on anybody. When someone wants me to make something on a commission there’s a lot of pressure, because then I have to drop everything I’m doing and do it all at once. I’d rather not work that way, although that’s how I do a lot of business. I’d much rather make it when I feel like it and give it to the gallery to sell when I have it. At the gallery you never really know what I’m making until I show up with it. Elle has requested a few things specifically for some customers; but that’s a little different. Usually they just buy whatever is on display. I don’t really have an answer for that, because there are a hundred trees that are wonderful, and they’re all so good. I do a lot of work with Maple because it has a lot of variety, but part of the reason that I do a lot of it is that it’s a native New York tree. I make most things out of local hardwoods. I think most of my signs up in the gallery say “beautiful woods of New York,” because I try to use trees that actually are around here. I do buy some exotics, like Ebony from Africa, and a few other strange woods. I use them in small quantities as accents on pieces, but I don’t buy a lot of wood from outside this area. Could you think of a favorite piece that you’ve done? I guess I have a lot of favorites. I’m a competitive woodturner. 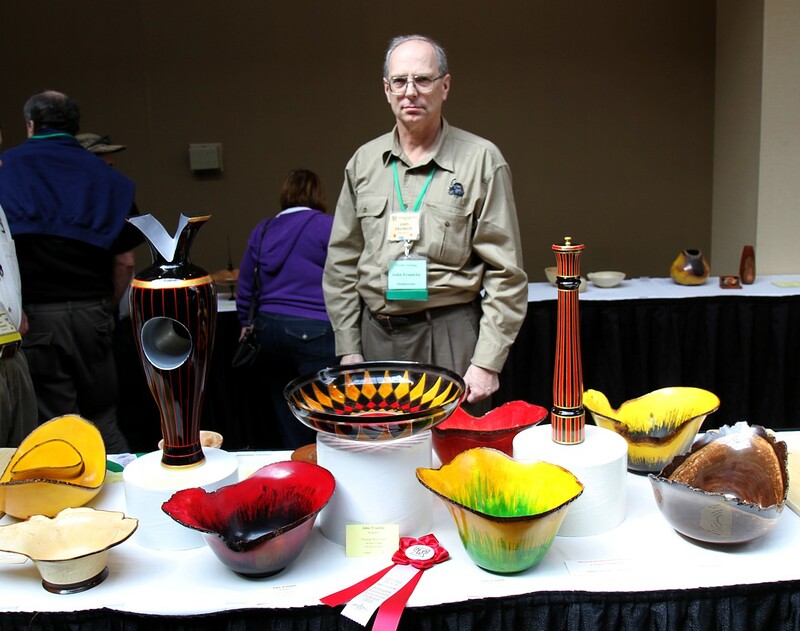 There is an annual event called Showcase, that’s run by the Northeastern Woodworkers Association out of the Albany area every year. The last weekend in March they have an open event, held in the Saratoga City Center. It covers five states including New York, New England, and New Jersey, so people come from a long way. 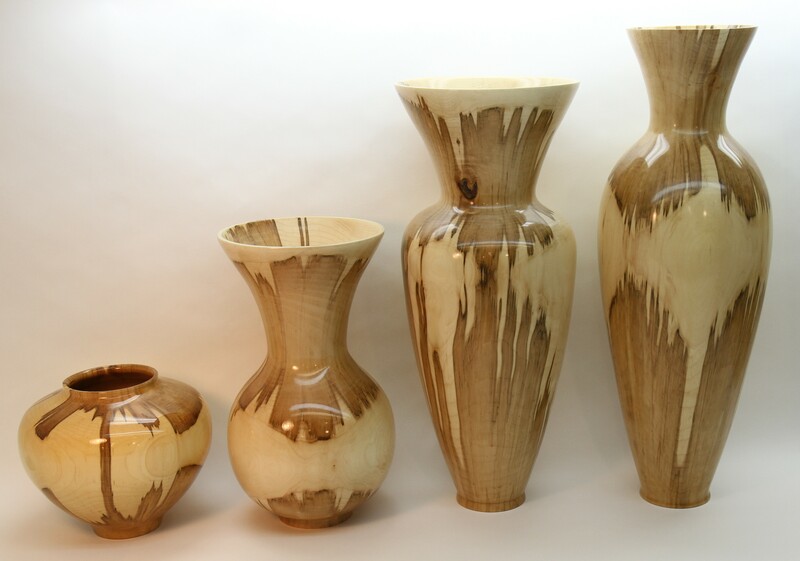 They have an open competition for woodturning and other woodworking categories including tables, chairs, jewelry boxes, desk accessories, Adirondack Furniture, Intarsia, Carving, and other types of wood working. I think there are about fifteen different categories. I make a lot of pieces for that event. It’s what I do for competition, kind of like running a marathon. I entered six pieces this year and I actually won five ribbons. When I’m turning against all the best turners in the Northeast, five ribbons is kind of unheard of. Last year I won four, previous to that I won three, but normally I win just one ribbon. I’ve been doing this for eleven years now, and every year that I enter a piece I have won at least one ribbon. So that’s part of the pressure, every year I have to make a piece that’s good enough to win one of the prizes. 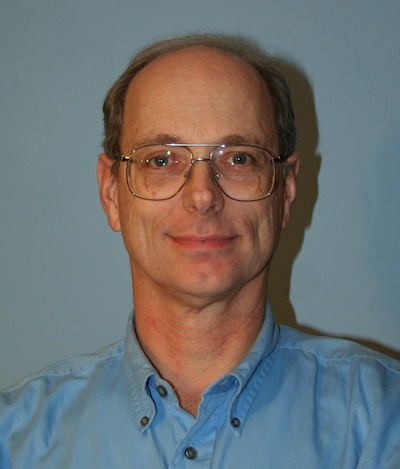 Keep an eye out for John’s work, he is one of the Kaaterskill Fine Arts & Crafts Gallery’s most sought-after crafters! What is your main focus as an artist? Do you generally stick to one thing or do you branch out to other mediums? 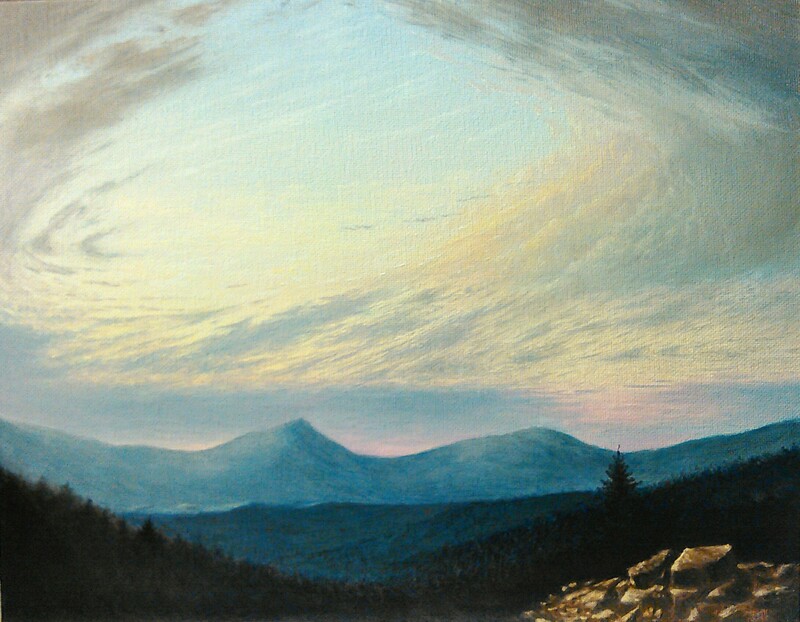 My focus is landscape paintings, most recently of the Catskill Mountains. 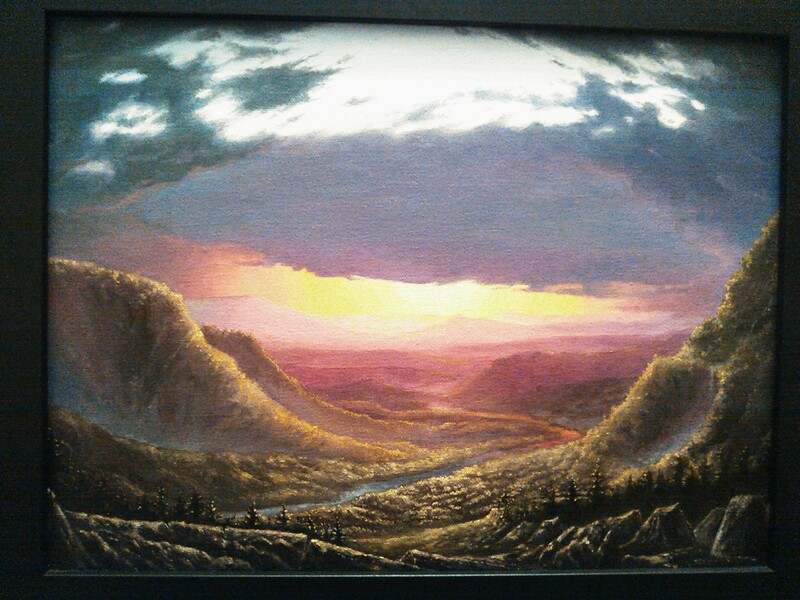 I paint landscapes in oil or acrylic, on canvas or paper, and draw with charcoal and graphite usually on toned paper. I have studied a variety of mediums, but I find those currently to be the most successful for both studies and studio work. What about the Catskills do you find inspiring? I find that the Catskill’s combination of extreme atmospheric conditions and dramatic topography make it an intriguing locale. Also its historical significance in connection to the early American Hudson River Painters, which I am influenced and inspired by. I know that some artists like to paint on location, and some like to photograph what they want to paint and do it somewhere more comfortable. Are you the guy with the easel, or the camera? I never paint from photographs, I do on site studies or works in acrylic, oil, and/or graphite. When I’m in the studio, I create more elaborate works from those done on site and from memory. Easels are cumbersome, I generally paint on my lap on site. How is working in the studio different from working on site? Studio work can be difficult at times, it depends on if I’ve prepared enough studies to create the work on the easel. The process on site is generally faster and more fluid and representational. In the studio I can be slower, and rather meticulous. If it’s a conceptual composition the lack or surplus of studies makes no difference. Inspiration is definitely found more on site, perched on the edge of a cliff with the sun in my face. What is the most beautiful landscape you’ve ever seen or painted? That’s easy. The most miraculous view I’ve witnessed is the view from North Point overlooking North South Lake, it is beyond sublime. The views from the eastern side of the town of Hunter looking west are some of the most spectacular I’ve ever painted, time and time again, and are the majority of my exhibit. Where did you grow up? Did that influence you as an artist? I grew up in Londonderry, New Hampshire, and attended college at The New Hampshire Institute of Art. The environment there is beautiful, and majestic, but the majority of my influence in landscapes has been derived from my time spent in Hunter. Do you listen to music while painting, or watch TV? I do occasionally listen to music when painting, I enjoy everything from jazz to metal. Some people find it hard to believe that I do very calm, focused, and detailed works, while listening to intense, spastic, and fast paced metal music. I don’t own a tv. What was your first experience in Hunter? My first experience in Hunter was when I lived here during the month of July in 2010 when I was accepted and partook in the Hudson River Fellowship. I created an outstanding amount of work in that month and realized after returning to New Hampshire that I had to go back. I moved back here in November 2014 and have been creating prolific amounts of work since. Visit the Kaaterskill Fine Arts & Crafts Gallery to find out more about Steve’s upcoming exhibit! 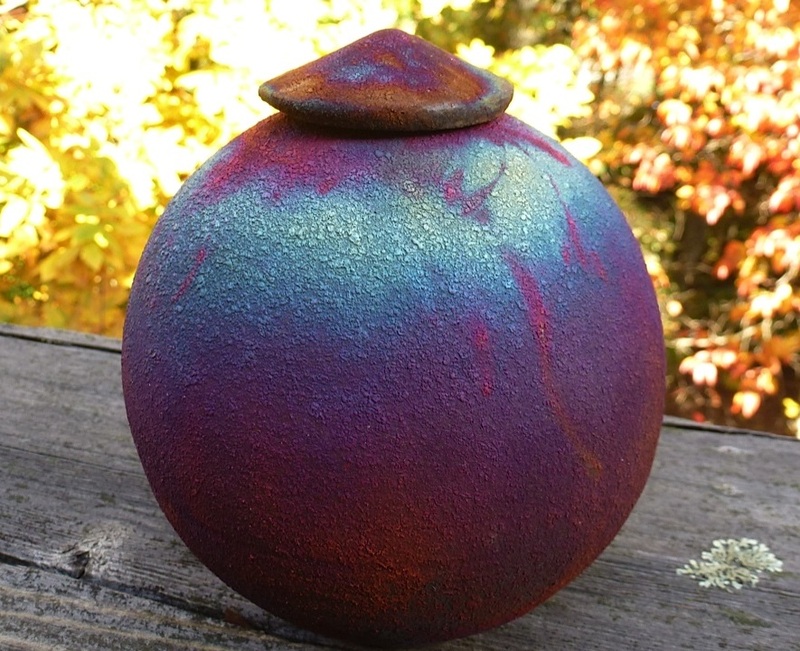 What inspired you to start making pottery? I have worked with some kind of art or craft since I was a child. I studied sciences in college and took several two dimensional art classes, which I loved. After working and raising my children, I continued with my love of art by studying metalsmithing. My work with metals and jewelry evolved into my love of three dimensional art, and I continued with working in clay. After a few years, I decided to get serious and spent some time at Alfred University; which is the Mecca of clay and ceramic art. I took a masters level intense workshop where I refined my skills and studied glaze making. Shortly after that, I was invited by the director of the Art League of Long Island to start teaching and coordinating their Ceramics Department. I continued with that and worked there to develop the program and all of the glazes that are used there. Are you exclusively a potter or do you make other kinds of art? At this time I consider myself a Ceramic Artist and Jewelry Maker. I mostly make my work by hand-building with slabs of clay or throwing on the potter’s wheel. My work has been featured in the Kaaterskill Gallery of Fine Arts & Crafts since its inception. My jewelry is eclectic. It is a mix of some of my handmade ceramic beads and a colorful mixture of precious and semi-precious gem beads. I make mostly earrings and necklaces because I feel they are easy to wear for all occasions. 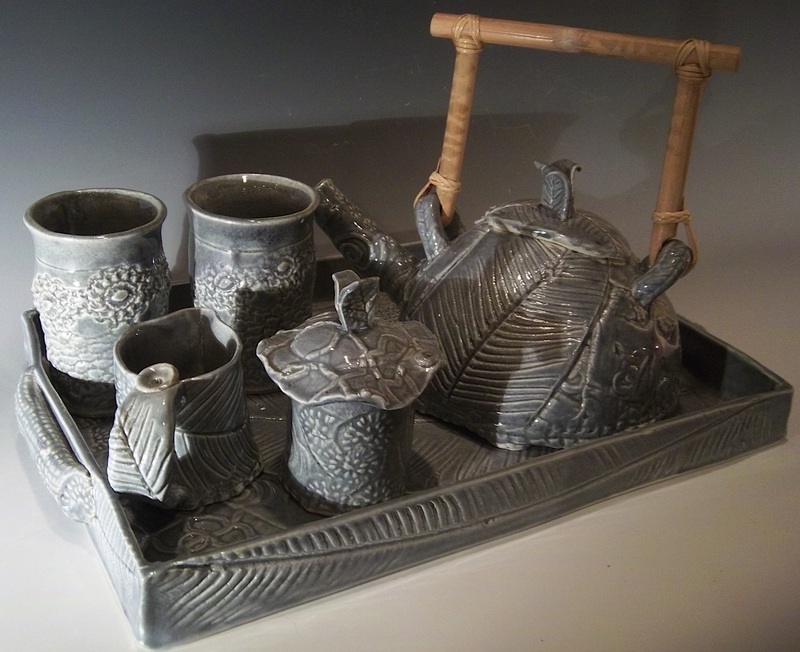 I have also curated ceramic exhibits on Long Island and in Greene County. My work is collected internationally and published in ceramic articles and books. I make mostly functional art by working on the potter’s wheel or by hand building slabs of clay. I draw my inspiration from life experiences. I am inspired by my surroundings; colors of the landscape on Long Island, and my love of the Catskill Mountains. I love texture and colors from nature. I form a lump of clay into something useful to be handled and used every day. It is my goal to give everyone the opportunity to touch and use my creations in their environment on a regular basis. It has become my passion. I manipulate my world by manipulating clay. Do you have a favorite musician? Do you ever listen to music when you create? I listen to music when in my own studio. I put on National Public Radio, and sometimes, I put a small TV on to keep me company and fill in on the news. I also like Scandal, Castle, and Downton Abbey, but I’m not strict about watching any TV program. If I miss it, it doesn’t bother me. I listen to Classic Jazz, Classical and sometimes Country music when I’m alone, otherwise, I find music distracting – especially while teaching or doing workshops. My background is quite simple. I grew up in a small town in New Jersey and went to a regional High School. My parents both worked very hard to make it possible for me to go to college; I was the first in my family to attend. I went to a small college in upstate New York where I earned a Bachelor of Science degree. Immediately after college, I went to New York City to work. I met my future husband there, and we fell in love and got married. We moved to Florida where my husband was in the Air Force. Then, after military service, we moved back to New York City, then to Long Island where we have lived and raised a family. When our daughters were in college, I continued to advance my abilities in jewelry making and ceramics. I attended Alfred University to develop my mastery in ceramics and shortly after, I was hired to develop the ceramics program at the Art League of Long Island. After almost twenty years, I retired from my position. Personally, I love to travel and have been many places all over the world. My most recent favorite was Iceland. In the winter I love to ski at Hunter Mountain, and summer finds me fishing on Long Island. 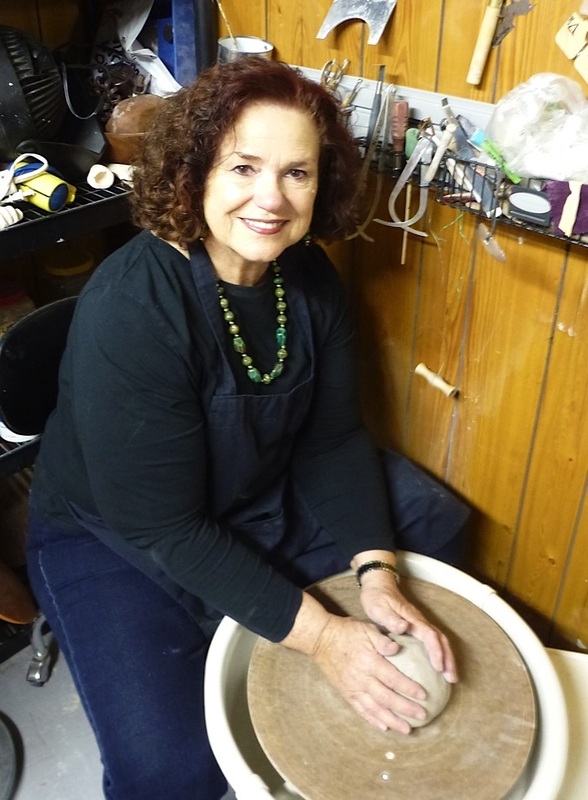 After almost twenty years of teaching beginning through advanced students hand-building, wheel throwing, Raku, and workshops in tool making, mold making, and coordinating the program at the Art league of Long Island, I have retired. I look forward to working in my studios on Long Island and in the Catskills and continue my passion – clay. 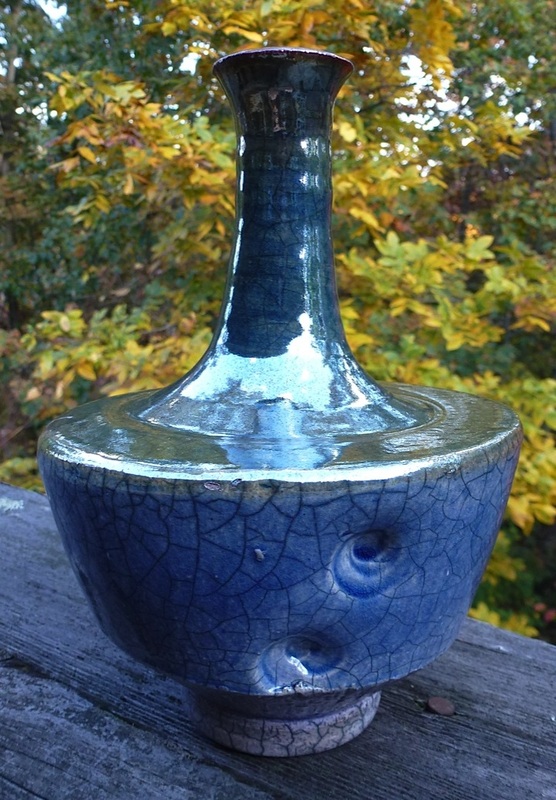 Ruth’s work will be featured in the Kaaterskill Fine Arts & Crafts Gallery, coming soon!